Book a kiwi tour and discover Auckland - The Sail City, Wellington, Christchurch or Queenstown. Get lost in the fairy tale landscapes you've probably seen in Lord of the Rings, including the breathtaking scenery you'll discover in the North and South Islands. "Great tour and great guide." "I absolutely loved my South Island tour with Wild Kiwi! The people, the views, the..."
"Great tour! Would definetely recommend it"
"It was thr first timr I did an organised tour and it was a very good experience!..." "Wild kiwi is the best option for a tour throughout New Zealand, they have great itineraries,..."
"Great experience because is fun and safe!" Hobbiton Movie Set: Take a guided tour through the world famous movie set of The Lord of The Rings & The Hobbit. Milford Sound: Discover the remarkable beauty of spectacular waterfalls, snow-capped mountains and dramatic fjords. Waitomo Caves: Marvel in mysterious subterranean caves, underground rivers and thousands of glow worms. Bay of Islands: Snorkel, swim and sail around the 140 subtropical islands. Rotorua: Enjoy captivating fine art performances and experience the traditional ‘hongi’ greeting at an authentic Maori village. Hot Water Beach: Dig your own natural spa bath in the sand and soak up the Coromandel surround. Abel Tasman National Park: Hike, kayak, sail or take a water taxi to get a taste of the park’s natural golden sand beaches and brilliant blue waters. Island: While in New Zealand you can visit the Northern or Southern island. Auckland: Admire the City of Sails harbour and explore this stunning city. 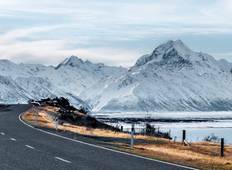 Road trip: Travel through New Zealand in a road tour, stopping for admiring amazing sights. Hiking: There are many hiking and trekking spots in New Zeland, for all the expertise levels. Queenstown: Release your inner adrenaline junkie in Queenstown and from there take a 3-day loop around the deep south of New Zealand. Boat: Take a boat tour around the two islands of New Zealand and swim in the ocean. Fiji: Take a tour that travels also through Fiji, an amazing archipelago with awesome beaches. Australia: While in southern emisphere, take your time to visit also Australia and its cities. "My New Zealand tour was memorable because of Isobel, the tour guide. I did not know what to expect on my Contiki tour but as it turned out, Isobel made it wonderful." "The New Zealand experience was fascinating. There isin't anything not to like about New Zealand, it is an awesome country with beautiful sceneries, the people were amazing and the food and drinks were superb. Our tour guide (Isobel) did a fantastic job as she knew all the best places, encouraged us to do something bit different or scary (like a bungy jump) and her good taste in music kept us going in the mornings if we were feeling a bit worse for wear after a night out. I highly recommend this New Zealand tour." "This New Zealand tour was amazing. I made some good friends during the travel and what made the tour enjoyable was the tour guide (Isobel), she was very informative and helpful as well as hilarious and fun to be around. I highly recommend this New Zealand tour to family and friends and will definitely do another one."